As I've mentioned many times before, I have an obsession with anything monogrammed. It could be because I happened to get one of the coolest letters ever, "N", but that's a biased opinion. I also love ampersands. I know, I'm weird. Steve and I have done some major home decor renovations in the apartment the past couple of months (my way of coping with the fact that we didn't purchase my Westchester dream-home as I had led myself to believe we would). 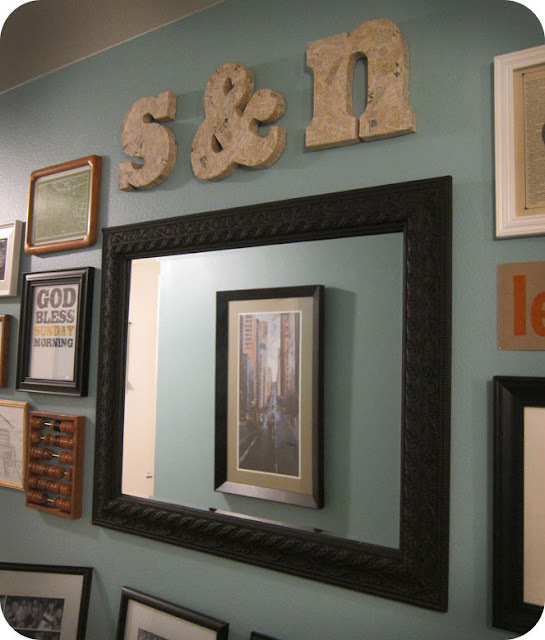 As part of re-doing our oversized hallway, I wanted to find an "N", "&", and "S" to hang above our mirror. Unfortunately, the fabric-covered letters from Anthropologie are a little to feminine for my boyfriend's taste and, unless I want NY Giants memorabilia evenly spread throughout the house, I have to respect his wishes for a not-too-girly apartment. For the base of the letters I used a sturdy old box. I figured corrugated cardboard is easiest to cut, but be careful because it also bends easily- not good for structural purposes. If I were to make another set I might use chipboard or foam core instead, but this works fine if you're careful. For the spine of the letters I used a lightweight cardboard I stole borrowed from work. Posterboard would also be ideal. The bendier, the better. Other Ideas: Aside from painting the finished product, you could also cover them with fabric, fabric strips, paint them, or use maps (another fave of mine). The options are endless!